Australian Mercy is launching its 2014 Christmas Appeal. Each year we provide a Christmas party for over 2000 preschool children in Mae-la camp. The Christmas party involves fun and food, and presents and the telling of the Christmas story. This year children in 2050 children will be catered for. 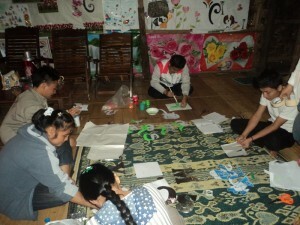 Each child will receive a Christmas meal (Karen Style – rice and chicken) plus a small ice cream and a small gift. Our budget is just over $1.50 per child. Preschool staff spend weeks in preparation doing signs, practicing funny songs and skits, and making decorations for the camp wide preschool event. Children from each preschool practice singing carols and songs. A great time is had by all. Morale in the camp this year has been low as cuts in the rice quota given to the camp bite in, malnutrition and disease are on the rise, our rice distribution program is providing nutritional supplements for the most vulnerable children. he Christmas party is another way we can also help with added nutrition and increase morale, it is an event that the children look forward to. Our appeal target which includes all costs is $3500. 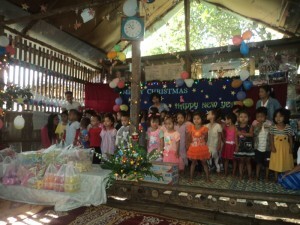 Your donation will help to bring a Christmas smile onto the face of a refugee child at Mae-la camp. Donations can be made through our secure site. Please select the Annual Christmas appeal donation target.